A 27-plus-footer weighing only 2000kg? Meet the Bailey Rangefinder Capricorn. Sometimes become convinced that I really need to buy a new 4WD. I love my old Land Cruiser but its towing capacity – 2500kg – seems less relevant with each passing year. Then along comes a caravan that restores a little faith. I’m referring to the Bailey Caravans Rangefinder Capricorn, 27-plus-footer (overall length) that old Ruby towed with ease. Sure, there are plenty of vans available with an ATM of 2500kg or less, but few have the living space and creature comforts that are on display in the Capricorn. A different rig of comparable size and spec level would, I’d guess, weigh 500kg more. Bailey Caravans has its roots in the UK, but with its Rangefinder series of caravans it became the first European manufacturer to build vans in Australia. The company has long had a reputation for lightweight vans. But how does it do it? I don’t pretend to know all of Bailey’s secrets, but I do know the company strips unnecessary weight from the chassis, with the chassis design undergoing a computerised process known as finite element analysis. This process identifies potential weak points in the chassis for the company to reinforce. Lightweight ply is used throughout the van and the body construction plays a significant part, too. The walls and roof are hail-resistant fibreglass sandwich panels incorporating a high-density polystyrene core. The panels also incorporate a composite ‘skeleton’ made of recycled plastic. I was shown a sample and I have to admit that these plastic supports are tough – I wouldn’t be able to snap it with my foot like I could with a piece of meranti timber. The entire structure is interlocked via Bailey’s special Alu-Tech system. The body panels are clamped together using a framework of extruded aluminium, which contributes to the van’s overall rigidity. There’s more to it than that, but suffice it to say that Baileys aren’t your usual ‘stick and tin’ caravan. Back to other weighty matters. Our review Capricorn had a Tare of 2053kg, giving it a load carrying capacity of 447kg – a reasonable figure. Having said that, you can increase your payload capacity to up to 800kg in total as part of a chassis upgrade. Naturally, the Tare weight will fluctuate depending on optional extras. Our van was fitted with an optional nearside slide-out kitchen, an optional built-in vacuum cleaner (you read that right – it’s called the SweepOVac) and optional curtains. Speaking of the slide-out kitchen, it sits in the front tunnel boot and the Capricorn is the first Bailey to ever be fitted with one. There’s access to the front tunnel from the offside, too, and it’s here you’ll find the BMPRO BatteryPlus35 battery management system. There’s a tunnel boot across the rear of the van as well but it’s a little narrower than the boot up front. It is, however, large enough to store, say, a 2kVA generator. According to Bailey Caravans, the Capricorn is the only van in its class with dual tunnel boots. Under the roll-out awning, there’s a fold-down picnic table and two speakers, and a decorative fibreglass moulding adds a touch of style to the rear of the van. It is primarily a blacktop touring caravan – although we towed it on corrugated gravel – so it doesn’t sit inordinately high. However, there is a fold-out step beneath the Dometic quad-lock door. The pointy end of the van isn’t burdened by a great deal of equipment – there’s a couple of 9kg gas cylinders, a jockey wheel, ball coupling, break-away cable… and that’s it. Personally, I’d fit a stoneguard to protect the gas cylinders. I’d also invest in Bailey’s optional padded cover to protect the front of the van, including the large window that curves towards the roof. Underneath are twin 105L water tanks, which are designed by Bailey and include baffles to prevent the water in a half-full tank from sloshing about under tow. As standard, leaf-spring Roller-Rocker suspension is fitted, but a Cruisemaster CRS upgrade is available. The layout of our review Capricorn is split into three zones: living quarters, an amidships bathroom, and a front bedroom. While the Capricorn’s exterior looks good, the interior really shines – the rear club lounge is the van’s star attraction. It floods with natural light courtesy of large windows behind and either side. But where’s the table? Well, Bailey has opted for a portable unit, which can be shifted about according to the shape, size and number of people at the dinette; it can even be taken outside. I appreciated that Bailey had included a dedicated storage nook for this table – you’ll find it in the bedroom. I also appreciated the dual USB charging point in the leg well of the dinette. It certainly is a classy interior that’s further enhanced by the LED strip lighting above the locker doors. The kitchen isn’t lacking equipment. It comes with a cooktop and griller, a microwave sensibly fitted below the sink, a 185L Thetford three-way fridge, and more. You might say that it’s missing an oven but, personally, I’d prefer the cupboard – how often do you use an oven when you’re on the road? Next to the fridge, under a flip-up lid, is a top-loading 2.5kg washing machine. The bathroom features a nearside cubicle with a cassette toilet, washbasin and a couple of cupboards, while directly opposite, on the offside, is the shower cubicle. It’s as neatly fitted out as you’d expect from a Bailey, but the best part is that the nearside cubicle door serves a dual purpose: when fully opened, it can latch into place to provide bathroom and bedroom privacy. The bedroom still gets a concertina curtain, though. The queen-size bed (with innerspring mattress) is surrounded by wardrobes and overhead lockers. These wardrobes, by the way, are particularly deep, and I liked the storage nooks with dual 240V and 12V powerpoints. The storage space under the bed is adequate, though it’s taken up somewhat by the walls and roof of the front tunnel boot. And let’s not forget the large, curved front window, which makes the bedroom feel spacious, light and bright. If towing weight is a concern, but you still want a large, well-appointed caravan, the Bailey Caravans Rangefinder Capricorn has to be on your list. But even if weight isn’t an issue, it’s still worth a look – top to bottom, it’s a stylish rig. Bailey also offers a three-year warranty on the van, and a 10-year warranty on water-ingress. 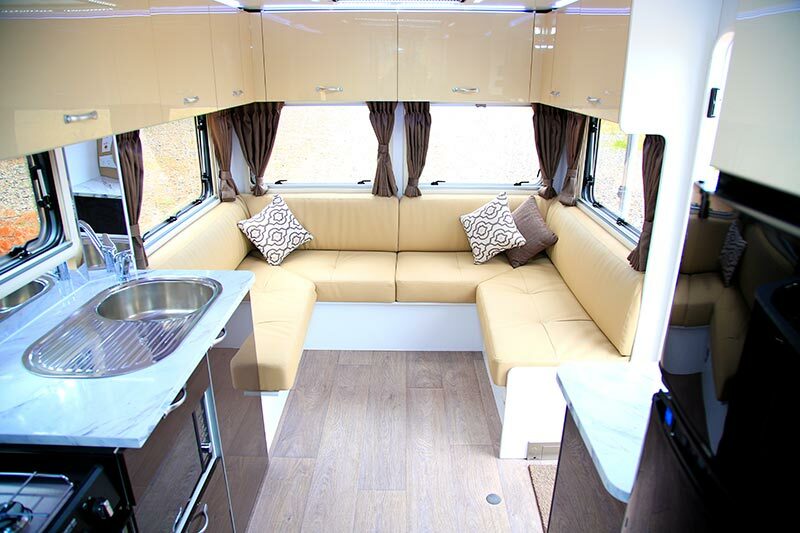 The Capricorn is a fully-equipped caravan flooded with natural light. It looks sturdy, it performs well under tow, and it’s reasonably priced.